The Apple Watch is great but it just doesn’t have the same grunt as an iPhone: its graphical capabilities are limited and memory is extremely tight. While I wanted to be as ambitious as possible with the watch version of Dare, I knew I’d need to cut corners to get it running. Plus there’s also its form factor to consider: the screen size is small and its aspect ratio makes certain types of games impractical. Dare’s main game mode on iPhone takes place over twelve increasingly difficult levels. Those twelve levels are spread across four game worlds. It was impossible to cram all that graphical content onto the watch and also to recreate all the unique elements found in each level, so I decided to make a simple endless runner for the watch that looked very similar to the Jungle world (Lava world on Dare the Monkey: Deluxe) from the iPhone version. I’m sure you’ll agree from the video above that I did a pretty decent job. In fact, there aren’t many Apple Watch games that have that level of visual quality. But, as I’ve discovered, the better you try to make something on the Apple Watch, the more you leave yourself open to criticism. The closer the watch version looks to the iPhone version, the more users expect from it. 1. Why aren’t all twelve game levels on the watch version? I’ll quickly address each one here. If you’re thinking about making your own Apple Watch game then I think it’ll be useful. The Apple Watch has a very tight runtime memory limit. On Series 1 devices that’s around 20 Mbytes which is pitiful compared to an iPhone. This makes it impossible to fit the iPhone version of Dare onto the watch. 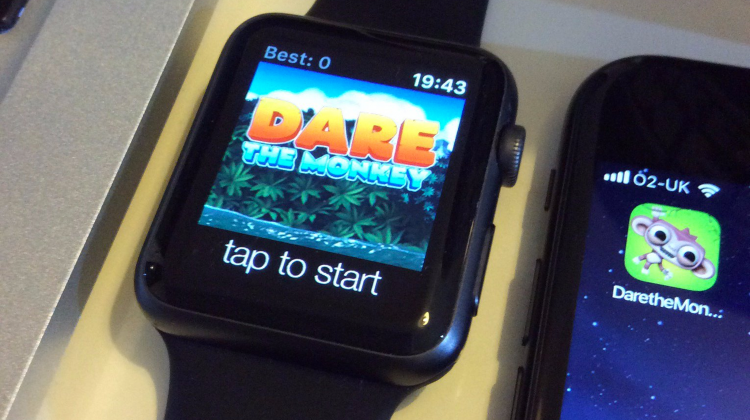 Instead I had to make a game that gives Apple Watch users a ‘flavour’ of the full-fat version of Dare. Again, this comes down to both runtime memory and the size of the app itself. It was hard enough to fit just the monkey onto the watch never mind five other characters. When you force-touch the Apple Watch screen it displays a context menu. Frustratingly there’s no way to turn off this feature within your game, meaning any user who touches the screen with any force will be presented with a menu while they’re trying to play Dare the Monkey. Until Apple allow developers to switch this feature off, it’s something all Apple Watch games are stuck with. On older Apple Watches the initial load time takes 20-30 seconds. Of course this is excessive but it’s the price you have to pay when packing your game full of visually rich artwork. Things are much improved on the more recent watches but there are still many users on first and second generation Apple Watches. For many of them that 20 seconds can feel agonisingly long. The Series 4 devices have a much larger screen. Dare has now been updated to take advantage of that larger screen size but I deliberately leave an area near the bottom of the screen blank (with a text prompt) so that the user can tap on the screen (to jump) without obscuring their view of the action. While many users complain about this black area it does have usability benefits that they unfortunately aren’t immediately aware of. So there you go. Hopefully there are some things in this article that other indie devs can learn from, or at least be aware of before building their own games for the Apple Watch. Just remember, the better you try to make your watch game, the greater the expectations of the user. And these heightened expectations can often lead to negative reviews. I’m certainly glad I spent the time making the Apple Watch version. It was two months well spent and a tremendous learning experience. Initially the negative reviews were a surprise given how much energy and effort I put into making it. But users are entitled to their opinions. After all, they’ve invested their time in my game. Time they could easily have spent on the thousands of other Apple Watch apps out there. I’m just extremely grateful they chose Dare the Monkey. If you’d like to check out the Apple Watch version of Dare the Monkey then you can get it here from the App Store. There’s also a Deluxe version, which features a different game world and new obstacles.